A series of motorized two-way valves, DN15 (1/2”) to DN80 (3”) , with flanged-end connection. ACTIVAL™ Models VY51_ _K and VY51_ _H are series of motorized two-way valves, DN15 (1/2”) to DN80 (3”) , with flanged-end connection. 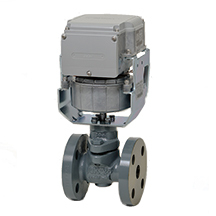 Valve and actuator are integrated in a single unit. The actuator fully closes the valve in case of power failure, so it is suitable for failsafe applications.